The National Center for Media Engagement has a wonderful set of tools and resources for planning, executing and evaluating community engagement (which also happens to be one of the Transmission Project’s core structural values). 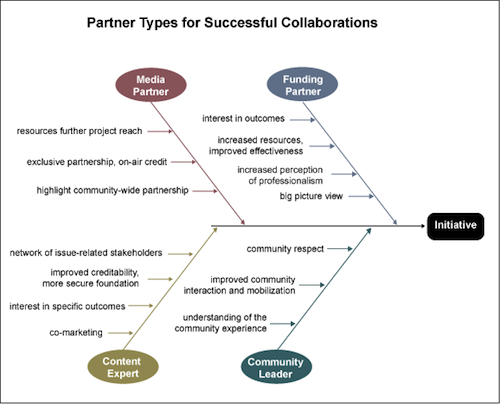 The above graphic is from the section entitled “Identifying Partners”. Together, public broadcasters (Pubcasters) and community media makers (PEG access TV, community radio, youth media, etc.) can help create a public media system that’s greater than the sum of its parts.